What are the differences between Content Groupings and Custom Dimensions in Google Analytics? When should you use one over the other? Those are questions I hear every single time I teach about Content Groupings in our Google Analytics trainings. So I decided to create this convenient guide to answer them. Let’s start off with some basic information about each option. Content Grouping is a feature in Google Analytics that lets you organize your pages into logical groups. Then you can view and compare metrics (e.g. Pageviews, Avg. Time on Page, Bounce Rate, etc.) aggregated by group. For example, if you have a site that sells different types of coffee, you can see which category of coffee (e.g. light roast, medium roast, dark roast) has the most pageviews, or which category people spend the most time drooling over (i.e. Avg. Time on Page). Google already records the page path and page title by default. Content Grouping is just one more (helpful) way to analyze your site or app’s content. 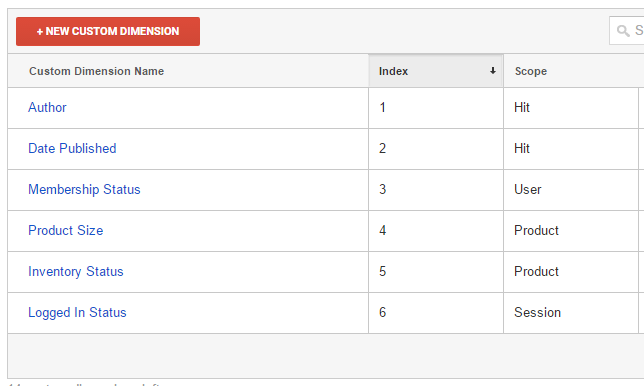 Custom Dimensions let you record additional, non-standard information in Google Analytics. You can record additional details about the page (e.g. author, content type, publish date, etc. ), session, user, and product. For the comparison purposes of this article, we’ll restrict our conversation of Custom Dimensions to those associated with the page. For more details about Custom Dimensions, Google’s help pages are a good place to start. We also have articles on how to define audiences with custom dimensions, how to report with custom dimensions, and how to filter with custom dimensions. That brings us back to our initial question – if they’re both so similar, which one should I use? To decide which option you should choose, you need to know the differences. For starters, you are limited to 20 Custom Dimensions per Web Property (200 with Premium!) For Content Grouping, the limit is five per View. That’s five content groupings or categorizations (like Coffee Type), not five groups of pages. Within each Content Grouping, you can have unlimited groups (like Light Roast, Dark Roast, etc.) that each have unlimited pages within them. Filtered Views – Custom Dimensions appear as filter fields (i.e. you can create a filter based on Custom Dimensions to apply to your Views). You can not filter Views based on Content Groupings. Data Import – You can use Custom Dimensions in conjunction with Data Import, but not so with Content Groupings. See below for more information about Data Import. Unique Views (metric) – This is a metric that is specific to Content Groupings. It represents the number of sessions in which a page in a group was viewed one or more times. This is similar to Unique Pageviews, but aggregated at the group level. Behavior Flow – These reports show you the paths people take through your site. With Content Grouping, you can see how they navigate from one group of pages to another. This is not possible with Custom Dimensions. Easier setup – In most cases, it’s easier to set up Content Groupings than Custom Dimensions. The latter requires additional code on your site (unless you’re using Google Tag Manager). Although there is an option to set up your Content Groupings with additional tracking code, there are two other options that require no code changes at all. You can simply group your pages with a set of rules (e.g. if the URL includes “dark-roast”, put it in the Dark Roast group). You can get even more sophisticated and group your pages by extraction. If you need to create a filtered View based on the additional page information, then Custom Dimensions will be necessary. For example, you may want a View that only includes only pages within a certain group (i.e. the “dark-roast” pages). That information gets associated with the page, just like the page title. This makes it possible to analyze your pages by any of the above dimensions. Maybe pages about organic coffee are viewed more frequently? If you don’t need to filter or do data import, then there is only one other reason to consider Custom Dimensions. Since they are set at the Web Property level, you only have to set them up once. With Content Groupings, they are set up at the View level. If you have dozens of Views and you have five Content Groupings, then you have to manually set up (potentially) hundreds of Content Groupings. I’ve been there, and it’s not fun. Content Groupings are not configurable via the Management API, so you just have to roll up your sleeves, queue up whatever season of whatever TV show you want to binge watch, and start clicking away mindlessly for hours to set these all up. If none of the above are a concern, then you should be using Content Groupings. Why? For the additional features (Unique Views and Behavior Flow). But also because they don’t consume one of your precious 20 Custom Dimension slots. It’s basically like Google is giving you five extra custom dimensions, that have some additional benefits. With Google Analytics Premium, this is less of a factor since you have 200 Custom Dimensions. However, you should still use Content Groupings for the other reasons.